Bits & Pieces: My First Radio Interview: Hear the Sizzle! My First Radio Interview: Hear the Sizzle! If you think you’re busy during this holiday season, imagine what it’s like for cooks and caterers. After a long day in a hot kitchen, meals they make for themselves have to be good, but fast. 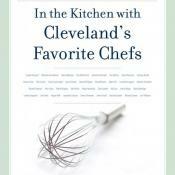 A new book takes us into the private kitchens of Northeast Ohio’s top chefs to learn the secrets of quick cuisine. WKSU’s Vivian Goodman visits with the author for a Quick Bite. Eight slices of bacon are coming to a crisp in Maria Isabella’s west side Cleveland kitchen. She says the beauty of this particular appetizer is that it is sweet and salty. This recipe comes from Nolan Konkoski of SOHO Kitchen and bar. It’s something quick and easy that she watched him make at home. Maria Isabella is a personal friend of Cleveland’s most famous chef, and Michael Symon provided entrée to the homes of many others. She persuaded 35, including Zach Bruell, Jonathon Sawyer and Loretta Paganini, to let her watch them whip up something quickly for themselves and their families. Like Pete Joyce of Crop Bistro. A copywriter who always wanted to write her own book, Isabella grew up on ethnic cuisine. In at least one case she was amazed by how quickly a gourmet meal came together. It’s cream of butternut squash and roasted red pepper soup; seared Mediterranean bronzini with verges butter sauce and sautéed fennel; roast duck breast with cherry glace de viande; and potato mousseline; and then madeleines. Isabella says D’Amico worked non-stop and got it done in less than an hour. That was her only requirement for the chefs, and her friend Michael Symon almost gave her a hard time about it. Isabella chose her 35 chefs with care. 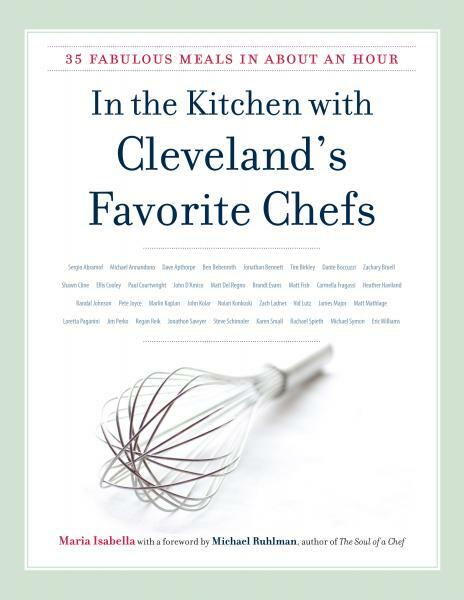 Most who contributed to “In the Kitchen with Cleveland’s Favorite Chefs” have won either the Zagat Award or Cleveland Magazine’s Silver Spoon award . And that’s this week’s Quick Bite. Next week we’ll re-visit Breakneck Acres to see what’s new for small farmers in the new year. 2. Sauté the bacon in a skillet over medium-high heat until just beginning to crisp. Transfer to paper towels to drain. 3. Spread 1 tablespoon of the preserves over one of the baguette slices. Top with a piece of bacon, add a piece of Brie, and place on a baking sheet. Repeat with the rest of the baguette slices. 4. Bake for about 4 minutes, or until the Brie begins to melt and the bread is just toasted. Serve warm. What a great segment! And the bacon sizzle was a nice touch!! Happy Holidays, Maria!